Recognize the name? 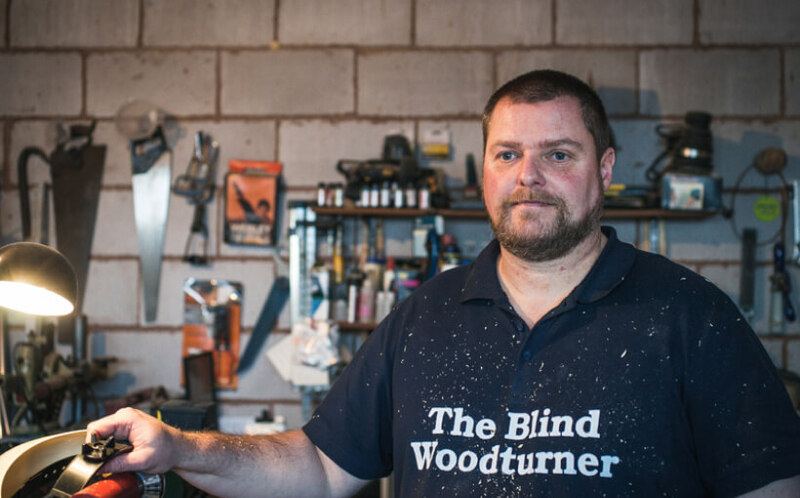 Chris Fisher is best known as The Blind Woodturner on YouTube from Whittle-le-Woods, England. His story of vision loss and fueling his passion to encourage is just as shareworthy. In 2008, Chris lost his sight to a virus called Toxoplasmosis. The first few years were challenging and anxiety-ridden, but Chris still sought to rehabilitate and relearn the skills that sighted folks often take for granted. He found his passion in woodturning about four years ago, when he one day decided that he wanted to make a vampire stake (he’s also a massive horror film fan). Striving for authenticity, Chris strategized that he could listen to YouTube tutorials to learn how to make one on his own. After four months of listening to four hours worth of videos a day, he was ready to begin. I was constantly building up mental pictures and images related to the subject like you would if you were listening to a book, and I ended up with my vampire stake. From that genesis point, it’s been great learning this craft and it’s great to get in the workshop and be creative and be expressive. Chris decided to start his own YouTube channel to “inspire and motivate people” within and outside of the blind community. Not just people with a disability or [who are] blind; people from all walks of life that are able-bodied and they’re just going through a tough time, they might be late with the mortgage repayments or their kids are sick - whatever it is, don’t look at it as a bad day just look at that day as a series of challenges. When he came across a YouTube review of Be My Eyes, Chris had his son, Charlie, download the app immediately. Be My Eyes is a tool for blind and low vision users that foster independence. Chris explains, “I’m quite gung-ho, but there are times throughout the day or throughout the week where you need help … Be My Eyes is great for that”. At the woodturning table, Be My Eyes volunteers help Chris confirm the color of a particular species of wood or read a label of a type of wood aloud to him. But the app also comes into play in the kitchen or if Chris wants to listen to a movie. What blows him away is the personal connection with people from different countries. That little bit of help they might give us over the course of a few minutes, it’s a big thing for someone that’s blind or visually impaired. And to have access to that personal contact … I couldn’t imagine life without it.